Cambridge Analytica say they played a massive role in the election of Kenya’s President Uhuru Kenyatta (L) who beat Raila Odinga (R) last year. 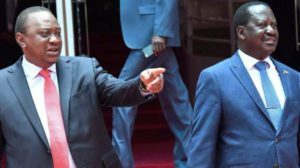 BBC- A full investigation must be carried out into a UK consultancy firm which helped take Kenya’s President Uhuru Kenyatta to victory, the main opposition coalition has told the BBC. There was no immediate comment from Mr Kenyatta’s Jubilee Party. Cambridge Analytica first hit the headlines after helping US President Donald Trump to his shock win in 2016. However, questions are now being raised around the world over its methods– including the use of data harvested from people’s Facebook pages. Before they helped Mr Trump, however, the company was active in Kenya, using the work it did for Mr Kenyatta’s successful 2013 election as one of its case studies.